It’s over. Let’s pop the champagne, ignite the loudspeakers, switch on the spotlight and proclaim the winner. It’s Russell Westbrook. He just recorded his 34th triple-double, leads the NBA in scoring with 31.7 PPG, and has sparked the Thunder’s lightning with an impressive 39-29 record (sixth in the West) — all minus Kevin Durant. Impressive? No. We need a better adjective. How about the letters M-V-P? Let’s discuss that triple-double (which means, to the non-basketball fan, that he reaches double digits in three categories, usually in points, assists and rebounds). The all-time record for one season belongs to Oscar Robertson’s 41, which he achieved in 1962. Fifty-five years later, Westbrook has 34 ‘TDs’ with 14 games left. This means that if he records a triple-double in every other remaining game, he’ll at least tie “The Big O’s” milestone. Given that his jersey number is “0,” will Russell break that record and be crowned today’s “Big O?” I think he will. I hope so. As each game passes, fans will watch. It’s like Golden State last year when we kept score until they won No. 73. With his latest triple-double, recorded last Thursday against the Raptors, that was his fourth straight. In that game, despite sitting out the 4th quarter, he made 16 assists — more than the entire Raptors squad. How ludicrous is that? And he’s not a hulking LeBron; he’s the same height as the 6’3” James Yap. HARDEN. But, wait, because the NBA has 30 teams with 15 per squad for a total of 450 players, who else is vying for the Maurice Podoloff Trophy, named after the league’s first commissioner? There’s Mr. James of the defending champs. Kawhi Leonard, who averaged 16.2 PPG in his career, now averages 26.4 and has spurred the Spurs to battle GSW for No.1. But the best rival for Westbrook? A possibility that Dennis foresees? 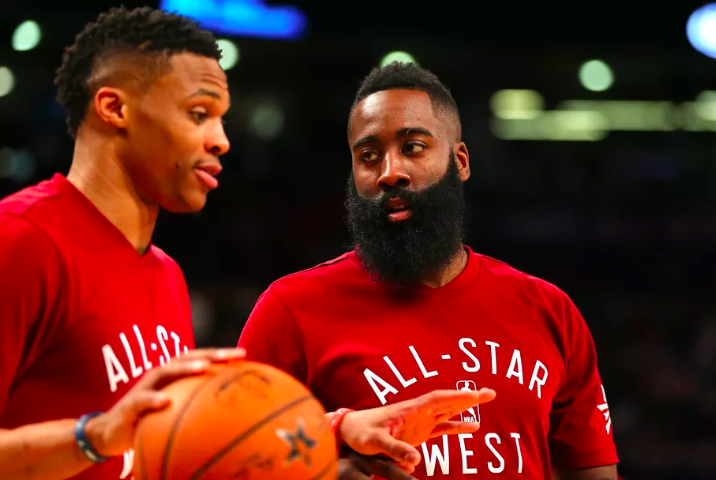 If last year the NBA had it’s first unanimous MVP in Steph Curry, how about its first co-MVPs in Westbrook and Harden?